Give a unique gift that gives back. This week Daily Grommet brings you unique gift ideas that support worthy causes. Humanity Bracelets. At first blush it's simply a fun and modern leather bracelet that winds around the wrist and fits everyone (the adjustable clasp means you can wear it how you like). Look more closely, though, and you'll see powerful messages in the silver lettering. "Speak kindness. Lead the way. Make a difference. Live in unity." It's not in-your-face, just woven around your wrist. You're literally surrounding yourself with positive messages -- which can come in handy when your spirit needs a lift. A percentage of every purchase goes to charity. ($26.00) Buy Humanity Bracelets here. Daily Grommet Gift Card. What better way to treat someone special on your gift list than with a cornucopia of presents from literally around the world? That’s just what a Daily Grommet virtual gift card offers. The lucky recipient can choose from hundreds of items that our Grommet testers have tried out, tried on, tasted, played with and fallen in love with. From popcorn to pogo sticks, underwear to outerwear, and snow shovels to sporting sails, Daily Grommet has something for everyone. Buy a Daily Grommet Gift Card here. Nyaya Health. Nyaya Health is an initiative founded to develop healthcare in rural Nepal and to extend its expertise to other parts of the world affected by poverty, isolation, war and neglect. All medical care is provided free of charge, and Nyaya employs all-Nepali staff who are supervised and trained by volunteer public health experts from Nepal and the U.S. Your contributions will go a long way. For instance, $25 will treat 10 children for pneumonia, $100 will provide a life-saving cesarean section, and $500 will purchase telemedicine equipment for mobile health workers to treat 2,000 people. Learn More about Nyaya Health here. Soles4Souls. Daily Grommet tells the story of how Soles4Souls started and how the recycling of gently worn shoes has helped people in 125 countries worldwide. In the time it takes you to read this sentence—about seven seconds—they'll give away another pair of shoes. Despite the great strides Soles4Souls has made, the need for shoes worldwide is enormous. Fortunately, it's easy for you to help their cause. Learn more about Soles4Souls here. 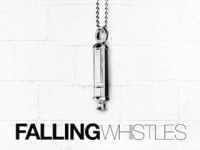 Falling Whistle. The Daily Grommet team tells the story of Falling Whistles whose mission is to help restore the lives of war-affected children, and to develop long-term coalitions to advocate for peace in the Congo. Give the sound of hope. 100% of the proceeds go to helping the children of the Congo. Learn more about Falling Whistles here.